Custom cutting boards perfectly add a personal touch to any unique, stylish kitchen. 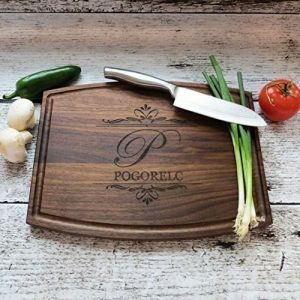 Such personalised cutting boards provide numerous customization options such as engraving of names, initials, and any other desired decorative designs. Unlike ordinary cutting boards, the personalized ones are great to offer as gifts to friends or loved ones. To the recipients, the unique designs and engravings serve as a lasting memory of your friendship and thoughtfulness. Plus, these boards function just like any other when it comes to cutting foodstuff in the kitchen. They’re made of materials you like, such as wood, plastic, marble, and tempered glass—an aspect that expands your customization options. Personalization technologies, such as laser engraving, art, and materials used in the creation of personalised cutting boards are a guarantee of long-term functional and aesthetic benefits. 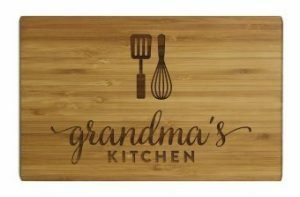 You have every good reason to opt for a custom cutting board that leaves a permanent impression on someone you hold dear. But each shopper’s requirements and tastes are different and so are the different designs and constructions of personalized cutting boards. Picking the best personalized cutting board is a question of figuring out the best design that communicates your thoughtfulness and companionship. With that said, consider what design templates are available because they can provide some inspiration for ordering the final product. If colour is important to you, then choose the right type of wood since that’s the final determinant of how your custom cutting board will look like, particularly if no stains are added. Also, consider shape– some custom board makers don’t include shape as part of your customization options, or the available shapes will be limited to a certain range. Once personalization has been figured out, the choice of material should be considered too. Custom maple cutting boards are great when you need a surface that’s gentle on your knife. Plastic boards appeal to chefs who are concerned about issues such as ability to put in a dishwasher as well as ease of cleaning. Bamboo is not only great for environmentalists, but also for cooks looking for something one-of-a-kind due to the uniqueness of the material. Unlike maple or wood boards, bamboo does not have self-healing properties. A tempered glass cutting board is extremely durable, but it’s not very easy on your knife. In a nutshell, consider the uniqueness of your kitchen or the personality and tastes of the recipient when choosing customisation options for a cutting board. This review will make your shopping experience even easier. 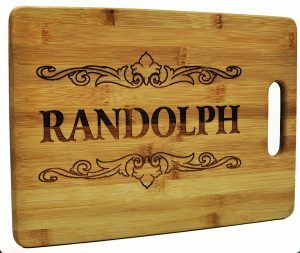 Choose the name of someone you hold dear to your heart and make it the focus of this name personalized engraved cutting board. You can pick any of the available wood types, including maple, cherry, walnut, and sapele to create the perfect gift for a wedding, anniversary, or housewarming event. This cutting board looks authentically original as it retains its natural wood colour, from design to the kitchen. The designer lets you preview your desired artwork before it can be engraved on the board, eliminating the possibility of design errors. The colour you get may be different from what you ordered since it’s coming from a naturally sourced and created product. The final appearance is fantastic though! Laser engravings may look awesome, but are also hard to predict precisely how light or dark they’ll be after finishing. Why You Should Buy This Product? 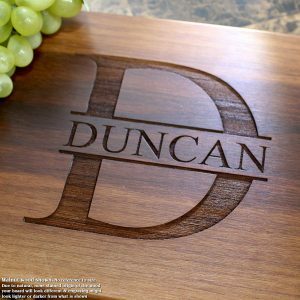 This personalised wood cutting board makes the name of the recipient the focus of unique design, including possibilities such as monogram artwork. It is thus, not only reasonably priced, but also the ideal gift for a family, friend, or someone you hold dear to your heart. 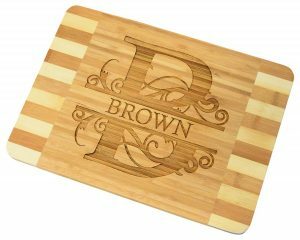 This personalised bamboo wood cutting board sports laser engravings that leave a lasting impression in the hearts of its recipient. An ideal birthday, wedding, or anniversary gift, this cutting board is made of durable bamboo to keep any kitchen shining with one-of-a-kind decor for long. The material of construction—bamboo, is source in an environmentally-sensitive manner, and so it’s ideal for any enthusiast of green cooking. Because this material does not readily absorb liquids, you can count on it to not warp or crack easily. 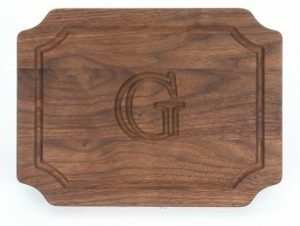 This personalized walnut cutting board is a gorgeous piece of artistic gift meant to naturally grace any special kitchen. It is made of walnut that’s sourced responsibly to help keep the earth green and reduce your carbon footprint. This material is very durable for enjoyable cutting of foodstuff. It provides a unique customization option—a gorgeously curved monogram that could be the initial of someone you hold dear. Each board is sanded by hand to ensure a shining, smooth finish. In addition, the personalised board is protected using linseed soil which is safe for food, ensuring it lasts longer without losing its authentic glamour. A juice channel on this cutting board not only adds to the uniqueness of the board, but also traps all flowing juice, keeping your kitchen counter neat every time. If you’d like to get a cutting board that can be used for cutting as well as serving your favourite appetizer combinations, this personalised walnut cutting board won’t disappoint. The board is also very light and relatively small to make your kitchen experience as entertaining as it can be efficient. Just add a family name between two stylish artworks to complete this unique personalised cutting board. Weighing just 2.3 pounds, it’s very light for easier handling in the kitchen, and won’t warp easily as bamboo is less water-absorbent compared with other woods. With the right care, this bamboo cutting board is very enduring and durable. The material is obtained in an environmentally-friendly manner, so it supports sustainable exploitation. This board is just thick and long enough for cutting veggies or meat with ease. 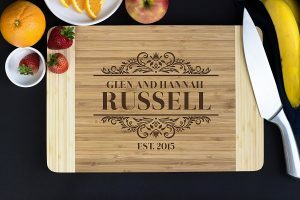 Get this bamboo personalised cutting board because it’ll serve as the perfect gift for a couple that just got married or is celebrating an anniversary. The provision for adding a family name personalization makes it very specific for gifting two people that mean the whole world to you. It is an inexpensive gift though. This custom bamboo cutting board is an awesome beautiful piece for gifting your dearest of friends. It comes with a personalised engraved side that will match the decor of any kitchen, and a solid side for all cutting requirements. Made of bamboo, expect this cutting board to be sturdier and last longer than other wood products. The material itself is harvested in a sustainable way, so using it poses no threat to the environment. It is just the right size for any special kitchen, and because it is pre-oiled it’s going to resist wear and tear for quite some time while serving its purpose. Get this personalised bamboo cutting wood for the kitchen of someone you hold dear because it’s easy to customize with just the name of the recipient. 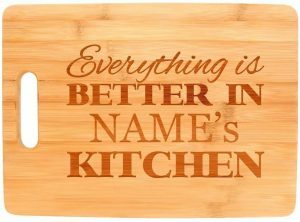 It comes with the wording, “Everything is better in___ kitchen,” a unique personalization option for any modern cutting board. This personalised wood cutting board is the ideal surprise gift for a special event, wedding, or anniversary. You may order it customized with a special message or information for the dear ones in your life. Pick any high-quality natural wood customization option including maple, walnut, sapele, and cherry to create a durable cutting board for a small or big kitchen. This product is not stained in the creation process, living it up to you to decide whether or not protectants are needed. 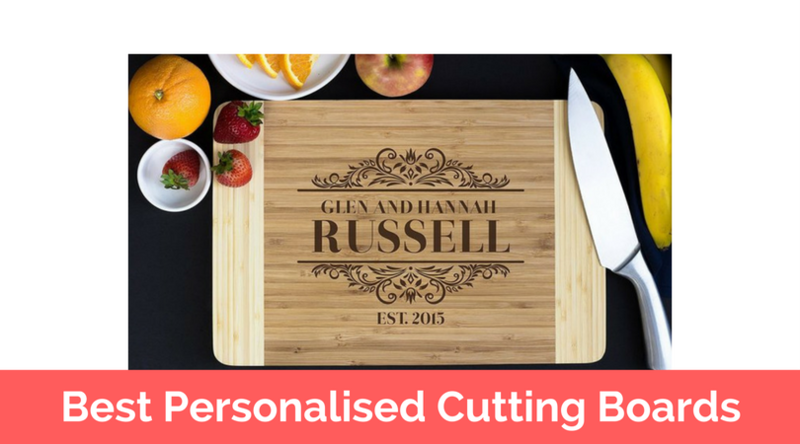 Get this personalised engraved cutting board if you’re looking for a piece you can customize with a gorgeous monogram, the name (s) of the recipient, date, and any other specific information. You will be offered an artwork for preview before the final engraving, ensuring no mistake in the ultimate design. 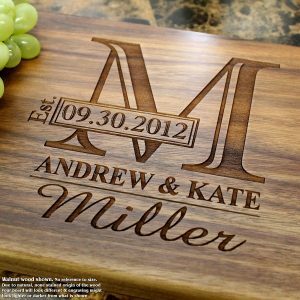 This personalized wood cutting board defines the perfect gift for a couple on a special occasion. It’s unique already as the design template features beautiful birds on a tree branch art. Write any special message or text for engraving to complete this one-of-a-kind presentation. There are different sizes for this product, so you can customize to dimensions that match the requirements and preferences of the dear ones you’re gifting it to. The choice of hardwood is no coincidence as it presents a range of benefits depending on the particular wood type chosen, including durability, bacteria-resistance, and ease of cleaning/handling. 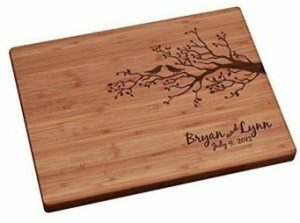 This is a kind of personalised wood cutting board that’s worth gifting a couple you consider special because it provides space for the engraving of the couple’s name as well as the special date. There’s no lamenting about size when it comes to this particular cutting board since you may customize the dimensions as well. What a personalized natural cutting board to make anyone feel special! You can customize it any way you want, be it with a name or title to communicate a special message to someone you care about. It comes with its own authentic, beautiful decorations within which you can apply any preferred customization. This cutting board is made of natural bamboo, so it’s a very green product that does no harm to the environment. Because the material itself is hard and durable, you can count on it to serve its kitchen purpose for long to the delight of the loved one you gift it to. The product may come from the same material, but its natural origin makes every piece as unique as it is gorgeous to stand out in every unique kitchen. The engraving themselves come out special and different every single time. This personalized bamboo cutting board is small—the ideal size for many kitchens. Its decorative engravings add an ornamental value to lasting kitchen function at a very reasonable price. This personalised wood cutting board is magnificent for your food preparation. Made of bamboo, this board is harder than other wood cutting boards like maple, and it’ll serve your cutting needs for long. Laser engraving ensures a lasting personalized impression meant for the one you love or care about. The board is customizable with your own personalized information, including date, name, and any special message. It is possible to order a significant change of design should you gather more ideas. Made from organic bacteria-resistant Moso bamboo, this personalised wood cutting board guarantees the health safety of any meal preparation. Its permanent laser engraving will make a great impression as a wedding gift. This walnut personalised cutting board is the perfect surprise gift for your dear one that loves to cook. It is made of natural wood, so expect it to be durable, less destructive to your knife, self-healing, and even free of bacteria. The cutting board sports natural wood colour to match the uniqueness of any kitchen, and it’s finished with natural oil to protect it while ensuring no risk of food contamination as you chop your meat or veggies. The burlap gif sac which the board is wrapped in completes this awesome presentation for your friend’s or relative’s wedding or any other special occasion. It measures 9 x 12 x ¾ inches, so it’s the ideal size for your food preparation requirements. This is a reversible board whose both sides can be used for cutting or gorgeous, unique engravings. This personalized board is made of walnut, and if you’re looking for a board that’s relatively softer than other woods, this is it! It comes at a bargain and will make fantastic work of chopping your veggies. By going through the personalized cutting boards listed here, you are already on your way to buying one that suits your needs best.